Kenmore hybrid water heaters are coming from the Elite series that are designed to use the heat pump technology and electrical heating elements for heating potable water in residential and light commercial applications. The combination of these two technologies allows fast recovery and high-efficient operation, which results in great energy factor of 2.4/2.33 and the first-hour rating of 68/84 gallons (depends on the model). Sears’ Kenmore hybrid water heaters are built in two sizes: 60-gal and 80-gal. The 60-gal unit has the size of 67"x24" and weight of close to 300 pounds, while the 80-gal unit is taller by 14" and heavier by 45 pounds, while the footprint is the same, 24" in diameter. Both hybrid models utilize many common features, such as the heating elements; upper with the heating power of 4500 W and lower with the wattage of 2000 W; water connections of 3/4", a minimum wire size of 10 gages, Eco-safe R134a cooling agent, brass drain valve, digital controls and other. At the top of the hybrid, the unit is the integrated heat pump. The heat pump consists of the strong 850-Watt compressor for the fast temperature increase and the external coil heat exchanger for the efficient heating. Efficient water heating is the result of the low standby heat loss as the units are equipped with the 2" thick foam insulation that has the R insulation value of R-16. When the water heater uses the heat pump, the ambient warm air goes over the coils and heat exchanger where it transfers the heat to the potable water. The benefits of the heat pump work are not only the efficient water heating that saves energy but the cooler and dehumidified air. The unit is capable of providing up to half a ton of cooling capacity and dehumidification, which can be used to supplement the air conditioning system. Thanks to the heat pump technology and advanced electronics, the Kenmore hybrid water heaters can heat water using both heating elements and heat pump in the same mode or independently. On the control panel, the user can choose one of the four different operating modes. In the Efficiency mode, the heat pump draws the warm surrounding air and use the heat exchanger for heat transfer to the water stored in the metal tank of the water heater. This is the most energy-efficient mode, where the savings are the highest and energy loss lowest. The heating elements are not used unless the ambient operating temperature drops below 45 F or goes above 109 F.
If the heat pump water heater uses the heating elements only, this operating mode is the Electric mode. The unit operates as the electric water heater; it uses only the heating elements to heat water, which results in low efficiency. This mode is useful if the surrounding air is cold, so the hybrid water heater cannot take advantage of the heat pump work. 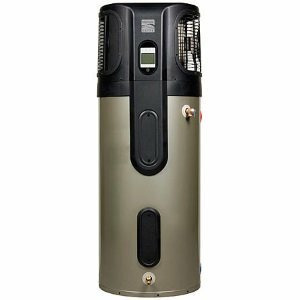 In the Hybrid mode, water heater utilizes mainly the heat pump technology, and if there is a need for more power, it turns on the heating elements. This mode is recommended in a situation when there is a high demand for hot water. Since there are two sizes of Kenmore hybrid water heaters, a larger 80-gal unit is the right choice for larger homes, so that the efficiency can be maximized. Hybrid mode is also recommended setting for filling a spa or hot tub since it provides the shortest recovery. This is also the default mode. If you are not planning to use the unit for some time, i.e., when going on a vacation, then the Vacation mode should be used. The controller adjusts the water temperature to approximately 60 F to prevent any freezing issues with the stored water inside the heater. Also, for the normal work, fresh air should always be provided. All the above and the recommended location spots such as a garage or basement (only indoor) should be taken into consideration when buying the heat pump. As said before, Kenmore hybrid water heaters are very similar to its electric-only counterparts. This is why the proper installation and maintenance is vital for the longevity of the unit. The unit can also leak, corrode, accumulate sediments and limescale and so on. As the Kenmore heat pumps are equipped with the powered anode rod, the electrical power must be applied to the anode to work efficiently. This is important as the anode protects the unit from corrosion through the electrolysis. For the best results, every user has an option to use one of the four heating modes. The operating modes can be changed on the user Interface module by touching the desired button and icon. The water temperature setting can be adjusted from 95 F to 150 F by using the up and down buttons found on the control panel at the top of the unit. The display on the control unit also displays the error message when the system detects the problem, making the troubleshooting process much easier. The Kenmore hybrid water heaters come with the 10-year warranty, but its working life depends on factors such as the maintenance, water quality, water pressure, and environment.